Meet MMHS Board Member Mike Woodward and learn why he loves Mandarin. 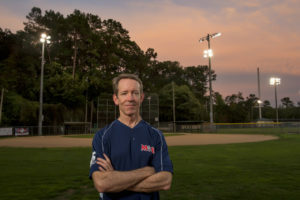 Mike chose to have his photograph taken at Alberts Field, home of the Mandarin Sports Association (MSA), where he served as a volunteer baseball coach for his sons’ teams for 17 years. “My wife, Lizette, and I have lived in Mandarin for over 25 years, and are proud to call Mandarin home. We met at the University of Florida, moved to Jacksonville for work, got married, bought a house in Mandarin (at the encouragement of a wise real estate agent, thankfully), and raised two sons (John and Jim). I am a geotechnical engineer with Amec Foster Wheeler. I have had privilege of working on numerous building and transportation projects around the local region and around the state during my 31-year career. My most memorable projects include the Bridge of Lions rehabilitation, a new one-mile long bridge on the Tamiami Trail through the Everglades, several buildings on the UF campus, and a proposed conversion of the old Ford Motor Company assembly plant next to the Mathews Bridge into loft apartments (which was, unfortunately, never completed). Talk about history! I learned some interesting history about Alberts Field from information provided by some of the other board members who grew up in the area, as well as from some online research. Bruno Alberts (1888-1970) was a man of many talents. In his youth, he studied painting at the University of Cincinnati, and became an accomplished portrait painter. After returning to his native Louisville, Kentucky, he joined his family’s stained glass business. The Luke and John window in the Episcopal Church of Our Saviour in Mandarin is dedicated to him, and he designed the chancel lights in the chapel. In the early 1920s, he became interested in orchids, and in 1935 he moved to Mandarin and built a home and greenhouses just north of the County Dock. There he developed many new strains of magnificent orchids. After semiretirement, he began to paint, and did portraits of many local people, as well as beautiful still life oils. His wife, Ann (1896-1991), was also an artist, and enjoyed painting orchids and still life compositions. The Alberts donated the majority of the property located at the intersection of Brady and Orange Picker Roads to Duval County for use as a park and playground, which opened around 1959. The Mandarin Orange Pickers, a semiprofessional baseball team in existence from 1925 to 1956, originally played their games next to the Mandarin Community Club building, but in the late 1940s moved to what is now Alberts Field. A surplus Camp Blanding building was used as the team’s clubhouse. Dances were also held in that building, which was located near the present-day tennis courts. MSA (originally known as Manretto Sports Association) was founded by E.J. ‘Red’ Glass (1924-2001) at Alberts Field in 1975.